The sole male, otherwise known as Daddy, in our house has a birthday today. All of his girls have been working hard on special somethings for him. 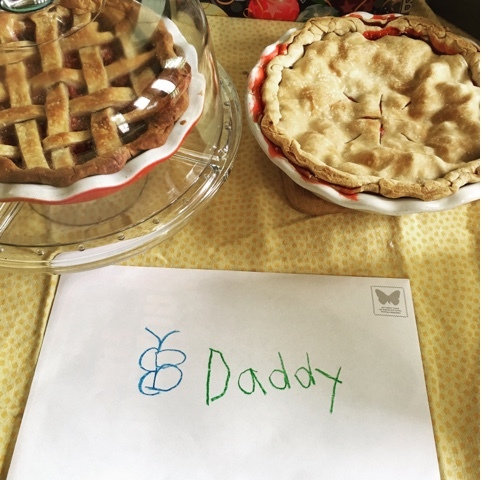 Because we have three birthdays during the month of May I was very pleased to fulfill his request of birthday pie instead of cake. Since pie becomes an endangered species in our house I went ahead and made two pies. More pie is always a good idea. We made sour cherry (left) and strawberry rhubarb (right) pies. I have frequently reminded the children that the ice cream is waiting patiently in the freezer to come out and join the party.....later on today. It was after all 7am when the smallest girls were ready to begin the celebration.